Overview: 21 Days, Team Project (3 Members), User Research consisting of screeners, user interviews, usability testing (3 rounds), competitive/comparative analysis, heuristic evaluations, sketching, wireframing, personas, user/task flows, user journey, rapid prototyping, high fidelity mockups and prototype utilizing Sketch and InVision. rights to the words they are sharing. Our team at General Assembly was approached by The Practical Dev to redesign their site in order to improve the current on-boarding process, sign-up process and overall usability of the site while also encouraging more users to participate in the community. After thorough research and testing, we focused on improving information architecture and hierarchy to improve the overall functionality of the site and its processes while maintaining the founders’ goals of keeping the site lightweight. My team evaluated various business goals including increasing user sign up and account creation rate, increasing active user rate, improving onboarding process and overall improvement of site features and layout. 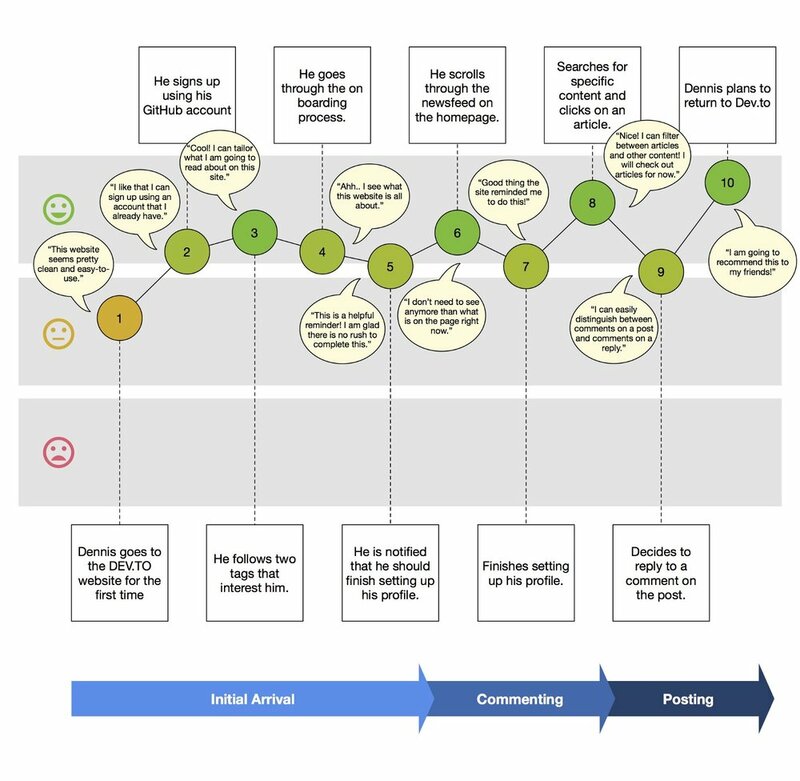 Based on our assumptions in conjunction with business goals, we kicked off our research phase with an initial problem: How might we improve the current onboarding and sign up process, while encouraging users to participate in the online community of dev.to? Using the ABBY Method, we evaluated dev.to on various factors such as findability, learnability and accessibility. 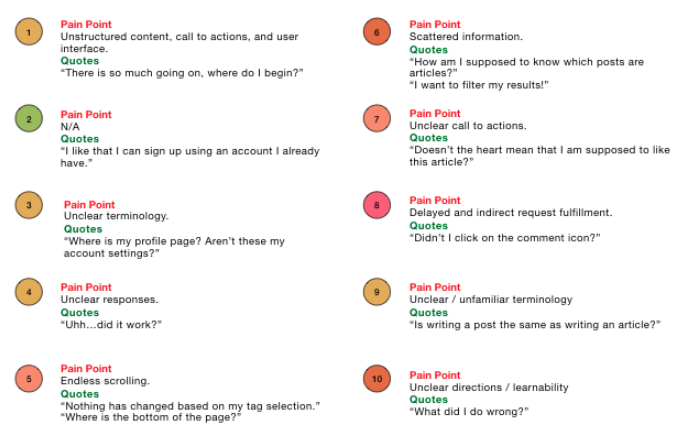 Goals: Our goals were simple, we wanted to figure out what the overall usability of the site was like and what some user pain points could be. 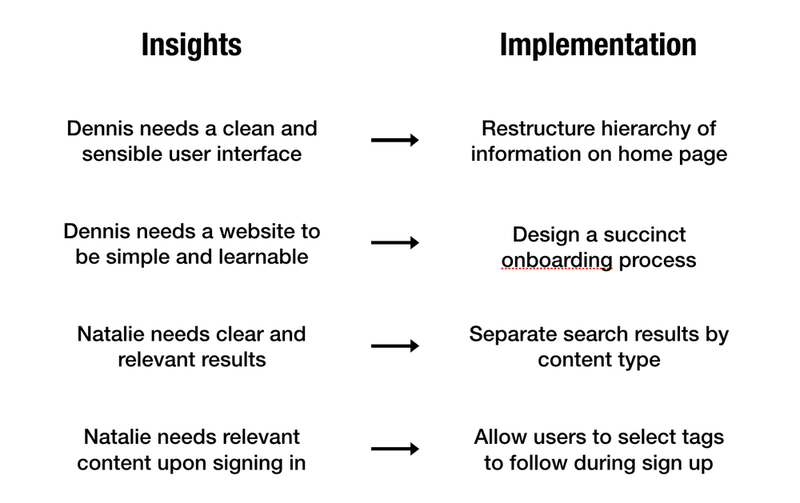 Insights: We found that the hierarchy of information on the site needed work, feature discoverability needed improvement and that the site was not as controllable as it could be. With our problem statement in mind, we decided to run competitive and comparative analyses in order to see what relevant sites were doing well and how dev.to could implement said strengths. 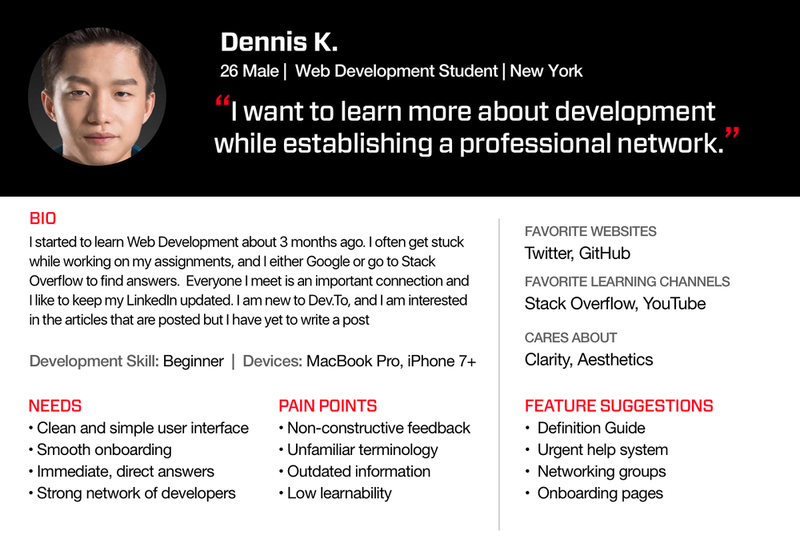 Site examples that we looked at were Stack Overflow, Reddit and LinkedIn. Insights: Some sites integrated simple features that were not present on dev.to. These features ranged from the way search results were organized and categorized, the variety of content that was available and the way posts were structured and separated on an interface. One of the steps in our synthesis process - grouping key points from our user interviews! 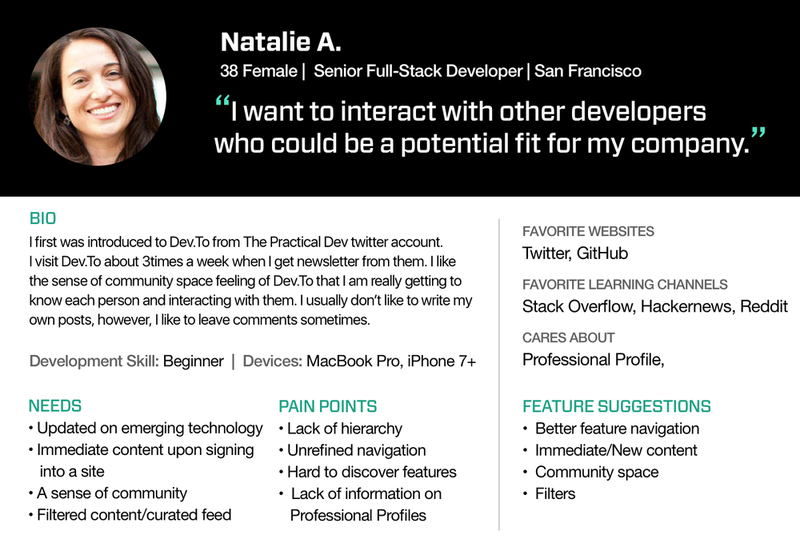 Insights: We found that a lot of users love the community that dev.to presents, they felt welcome and genuinely happy with the content that chose to click into. 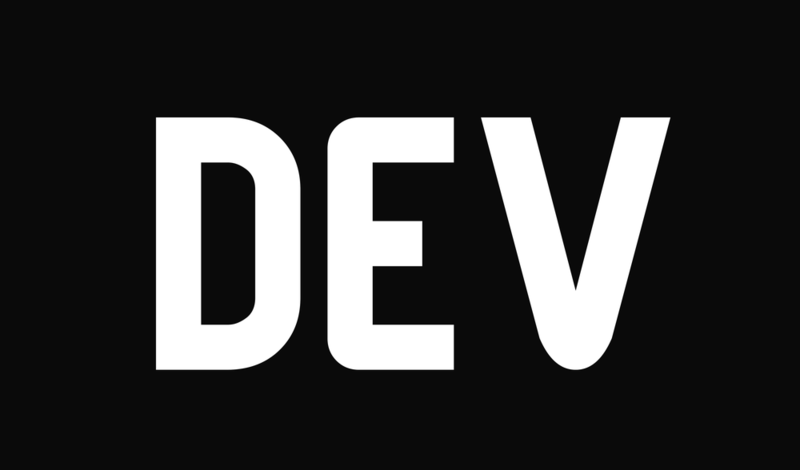 While the love for what dev.to is building was clearly felt, a lot of users were frustrated with various parts of the site. An initial problem that the site had was that the majority of their user base was clicking through to a post from Twitter or a Google search and were not entering through the homepage and thus missing out seeing a lot of the features that the sight presented. When users actually looked at the homepage, they were presented with a cluttered interface that was super confusing. We found that users were unhappy with the structure of the homepage, they felt that there was too much going on with the interface, some features were hidden (thus unknown to them) and that there was no specific structure to the information that was being immediately presented or showing up as search results. Even users who have been on the site since its initial launch were unsatisfied with the look of the site and the way things were being categorized. Visuals are important, structure is important and users noted that they would use the site more if it were friendlier to their experience! How might we strengthen dev.to community participation by improving the current site’s hierarchy of information? Once we settled on how our insights can be implemented in actual design changes, we moved into our design studio in order to see what these ideas would look like on an interface. After our design studio, our team digitized our ideas using Sketch and put together our high fidelity prototype (https://invis.io/PXE1KBPFQ) using Invision. With this prototype we moved into usability testing of our new iteration. We moved into phase 2 of user testing where we asked users to test our prototype. We tested 5 users with each going through 4 different scenarios ranging from going through the onboarding process to locating content that they wanted to see. A wonderful user going through our newly redesigned onboarding process! Insight: Dennis is much happier with the process. He is able to complete tasks as needed and had an easier time learning about the site and its functions.